New York Times bestseller M. C. Beaton's beloved Agatha Raisin—now the star of a hit show on Acorn TV and public television—is back on the case and poking around where she doesn't belong. But in M.C. 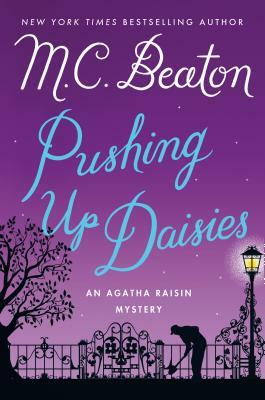 Beaton's Pushing Up Daisies, things are about to get a little less cozy. Lord Bellington, a wealthy land developer, wants to turn the community garden into a housing estate. And when Agatha and her friend Sir Charles Fraith attempt to convince Lord Bellington to abandon his plans, he scoffs, “Do you think I give a damn about what a lot of pesky villagers want?” So it’s no surprise that some in the town are feeling celebratory when Agatha finds his obituary in the newspaper two weeks later. Soon, another murder further entangles Gerald and Agatha in a growing web of intrigue as they work with her team of detectives work to uncover the killer’s identity. "Outwardly bossy and vain, inwardly insecure and vulnerable, Agatha grows more endearing with each installment." "Beaton has a winner in the irrepressible, romance-hungry Agatha."